Irritable bowel syndrome (IBS), also called spastic colon, is a functional bowel disorder characterized by chronic abdominal pain, discomfort, bloating, and alteration of bowel habits in the absence of any organic cause. In some cases, the symptoms are relieved by bowel movements. Diarrhea or constipation may predominate, or they may alternate (classified as IBS-D, IBS-C or IBS-A, respectively). IBS may begin after an infection (post-infectious, IBS-PI) or a stressful life event. Other functional or pain disorders and certain psychological conditions are more common in those with IBS. Several conditions may present as IBS including coeliac disease, mild infections, parasitic infections like giardiasis, several inflammatory bowel diseases, functional chronic constipation, and chronic functional abdominal pain. In IBS, routine clinical tests yield no abnormalities, though the bowels may be more sensitive to certain stimuli, such as balloon insufflation testing. The exact cause of IBS is unknown. The most common theory is that IBS is a disorder of the interaction between the brain and the gastrointestinal tract, although there may also be abnormalities in the gut flora or the immune system. IBS does not lead to more serious conditions in most patients. But it is a source of chronic pain, fatigue and other symptoms, and it increases a patient's medical costs, and contributes to work absenteeism. Researchers have reported that the high prevalence of IBS, in conjunction with increased costs produces a disease with a high societal cost. It is also regarded as a chronic illness and can dramatically affect the quality of a sufferer's life. IBS can be classified as either diarrhea-predominant (IBS-D), constipation-predominant (IBS-C) or IBS with alternating stool pattern (IBS-A or pain-predominant). In some individuals, IBS may have an acute onset and develop after an infectious illness characterized by two or more of the following: fever, vomiting, diarrhea, or positive stool culture. This post-infective syndrome has consequently been termed "post-infectious IBS" (IBS-PI). The primary symptoms of IBS are abdominal pain or discomfort in association with frequent diarrhea or constipation, a change in bowel habits. There may also be urgency for bowel movements, a feeling of incomplete evacuation (tenesmus), bloating or abdominal distention. People with IBS more commonly than others have gastroesophageal reflux, symptoms relating to the genitourinary system, psychological symptoms, fibromyalgia, headache and backache. Because there are many causes of diarrhea that give IBS-like symptoms, the American Gastroenterological Association has published a set of guidelines for tests to be performed to rule out other causes for these symptoms. These include gastrointestinal infections, lactose intolerance and Coeliac disease. Research has suggested that these guidelines are not always followed. Once other causes have been excluded, the diagnosis of IBS is performed using a diagnostic algorithm. Well-known algorithms include the Manning Criteria, the obsolete Rome I and II criteria, the Kruis Criteria, and studies have compared their reliability. The more recent Rome III Process was published in 2006. Physicians may choose to use one of these guidelines, or may simply choose to rely on their own anecdotal experience with past patients. The algorithm may include additional tests to guard against mis-diagnosis of other diseases as IBS. Such "red flag" symptoms may include weight loss, GI bleeding, anemia, or nocturnal symptoms. However, researchers have noted that red flag conditions may not always contribute to accuracy in diagnosis - for instance, as many as 31% of IBS patients have blood in their stool. 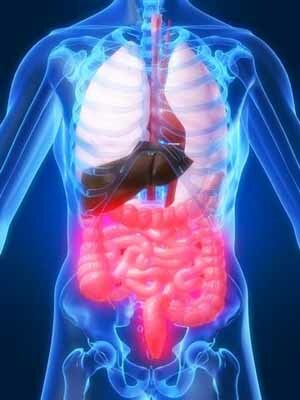 Inflammatory bowel disease: Some researchers have suggested that IBS is a type of low-grade inflammatory bowel disease. Researchers have suggested that IBS and IBD are interrelated diseases, noting that patients with IBD experience IBS-like symptoms when their IBD is in remission. A 3-year study found that patients diagnosed with IBS were 16.3 times more likely to develop IBD during the study period. Serum markers associated with inflammation have also been found in patients with IBS.